Experts predict it could be 30 days until Makhanda’s (Grahamstown’s) supply is reduced by half, forcing strict rationing across the city. As the academic year launches, Grocott’s Mail asked principals of some of our best managed state, public and independent schools what measures they have in place for a depleted and intermittent water supply. A crisis task team to mitigate disaster was launched at a meeting called by Makana Municipality on Monday 14 January. Business, civil society and government representatives learned that the main supply to the city’s western areas, Settlers Dam, is this week at 13.4% of its capacity. The much smaller Howieson’s Poort Dam, from which the western supply is pumped for treatment at Waainek, was this week at 23.1%, according to Peter Ellis, Managing Director of MBB, which has been contracted by Makana to manage water demand and repair leaks. Rhodes University, which contributes more than 60% of the city’s GDP, said this week it would have to close its doors if urgent solutions aren’t found to the city’s looming water crisis. Makhanda boasts some of the country’s best educational establishments that are the lifeblood of the local economy. Those with boarding or residence facilities have put considerable resources into securing their institutions and the young people they serve against service delivery failures. Water tanks, boreholes and strict water-saving regimes are some of the measures local schools have taken to secure continuous access to water. The no-fee state schools, serving the poorest of the poor in our community, are already on their knees after a two-day outage. Across the city, principals remain concerned about the possible impact of shortages on the health and safety of learners and staff. For Victoria Girls’ High School, a reduced and less reliable water supply would be problematic. VGHS has a number of water tanks on their premises and the school is able to utilise borehole water when needed. “We have been stressing the need for water conservation among our staff and learners for some time,” Schmidt said. The school’s biggest concern surrounds their ability to keep their hostels open. 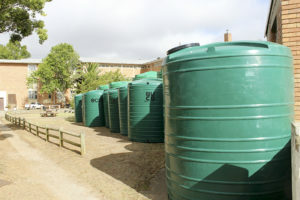 Graeme College Principal Kevin Watson noted that the availability of water resources had become a serious problem, not just in Grahamstown, but also on a global scale. “Water conservation is important on all levels,” he said. Graeme College needs water to cater for over 655 boys and a full staff component of educators and support staff, Watson said. The school’s boarding establishment caters for over 100 boys. To mitigate frequent water outages and alleviate the potential crisis, the Governing Body had invested in water tanks. In the current water crisis, the school had, as an emergency measure, linked the school borehole water to the water tanks to ensure toilets and showers would be operational. “Fortunately, the school has a strong borehole and we are able to water designated sporting fields in order for our extra-curricular activities to continue,” said the Principal, emphasising that the water crisis and the emergency measures had serious financial implications for the school. “Graeme College is monitoring the situation carefully and will do all in its power to ensure that teaching and learning is not disrupted,” Watson said. However, the school had limited resources, making them very dependent on the Municipality. Newly appointed Kingswood College head Dr Colleen Vassiliou replied to questions in consultation with the school’s Business Manager, Steve Gardner. A reduced and even less reliable supply would obviously be inconvenient and frustrating, but the school could cope, Vassiliou said. “We have a good alternative supply which could sustain us for long periods. The water quality, while acceptable, will have a detrimental affect on water heating systems if used for prolonged periods, which would then increase replacement frequency and therefore costs,” Vassiliou said. St Andrew’s College have their own independent supply and purification system and are thus not anticipating major disruptions, Principal Alan Thompson said. “We have several borehole sources and store water for contingencies, and we have several purification plants. We could remain open indefinitely. Thompson said the continual erosion of the credibility of Grahamstown was of really serious concern. 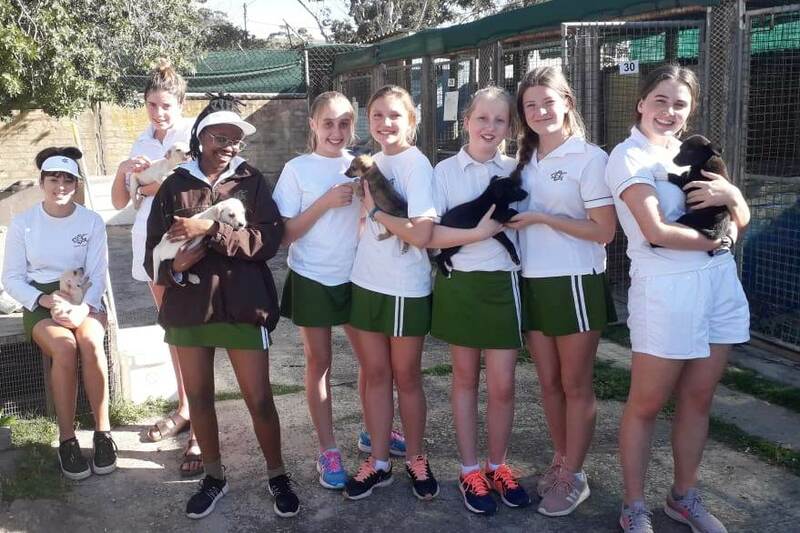 The Diocesan School for Girls had been investing in sound water management, storing rain water and implementing water-saving measures for some time, Principal Shelley Frayne said. These included flushing toilets using grey water harvested from showering; limiting showers to two minutes per girl and providing sanitation liquid instead of water to wash hands. “From the start of this year, there is rigorous action in place with ongoing communication and monitoring to ensure that our water consumption is kept to a minimum,” Frayne said. “We have intensified our water-saving efforts implementing showers every alternate day with evening swims on the days in between. Frayne said they could not accurately predict their capacity to operate indefinitely without a regular municipal water supply. “However we are hopeful that this eventuality never materialises. In the interim, we pray for rain and hold fellow Grahamstonians who are not as fortunate as we are in our thoughts. 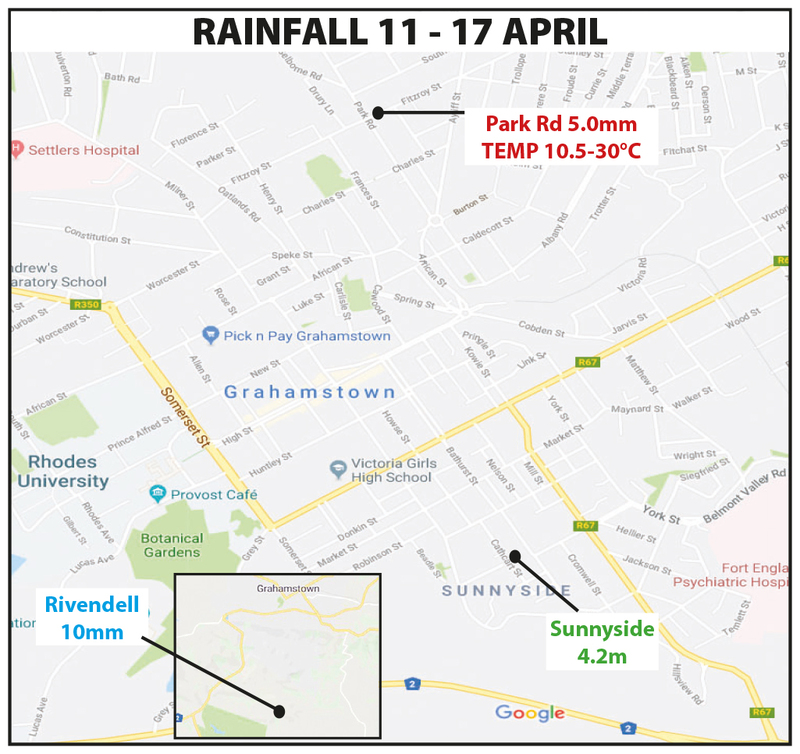 Ntsika Secondary School Principal Madeleine Schoeman said while water supply in Grahamstown East was generally less reliable, “at least we have had some water for parts of the day”. 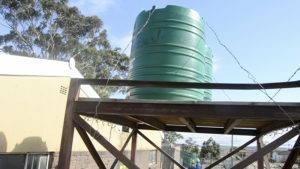 The school is grateful for the four tanks installed by Galela Amanzi a few years ago, with a 20 000 litre capacity. Self-sufficiency was the only answer for schools with less resources, Schoeman said. “We are grateful to Rotary Grahamstown who are working on a water and sanitation matching grant project for Ntsika. This will make us much less dependent on municipal water. Schoeman said she was also on the look-out for learners wanting to start making money for the matric farewell or a camp by enlarging the school’s (small) pond. At the moment and for a good deal of the fourth term of 2018, Nombulelo Secondary has water at the school for only a few hours in the morning. “At least this means that the cooking can happen for the Scholar Nutrition programme,” Principal Nicci Hayes said. Hayes said the school is looking at the possibility of further tanks. St Mary’s Roman Catholic Primary School relies heavily on a clean, reliable and consistent water supply to service the 761 learner and 36 staff members at the school, emphasises Principal Gerard Jacobs. “The lack of water affects the toilet facilities and the School Nutrition Programme. Toilets cannot be flushed, leading to health risks; cooking of food and washing of utensils become a challenge, leading to compromised hygiene standards,” Jacobs said. The school fortunately has a fully functioning borehole to supply water in the event of outages. Not only is this very time consuming, but it is also very difficult to keep the toilets clean because the five-litre containers provided need to be refilled at regular intervals for flushing. There’s no assurance that the school’s current management of water outages is sustainable. 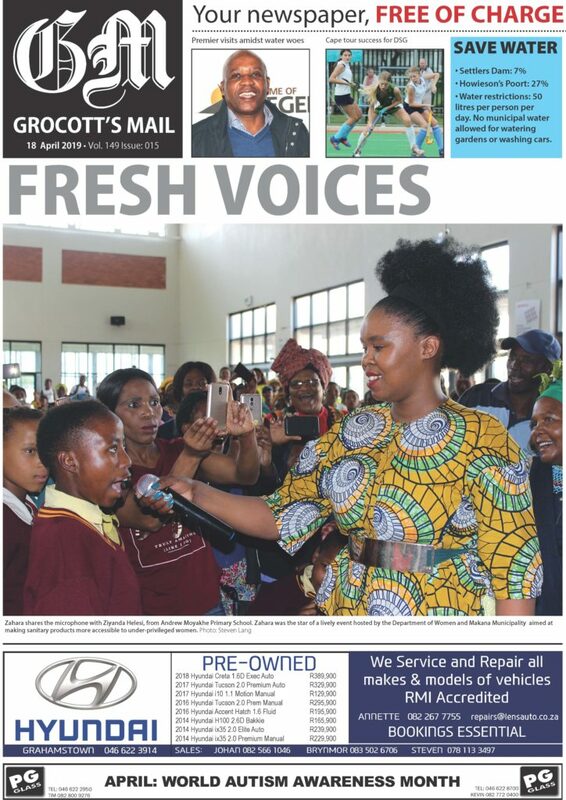 “This is going to have a huge impact in our schools and needs to be addressed and treated urgently,” NV Cewu Primary School Principal, Anele Ndyolashe, told Grocott’s Mail. “The worst part of it is that we don’t have water to flush the toilets”, he said. 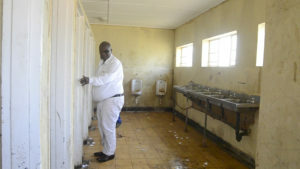 The toilets at the school were blackened with filth and decay, and filled with used toilet paper and waste. Ndyolashe feared for disease should the conditions not improve. The school, which along with the rest of Joza is served by the Glen Melville/ James Kleynhans system, already has to bring in water to prepare daily school meals and for drinking. The treatment works is short of one pump and so is currently delivering only half of its usual 10 megalitre a day output. The pump, which is being repaired, is expected to be operational again after 21 January. Meanwhile, the staff and children fill up empty buckets whenever water is available. “I don’t know – I will judge each day as it comes,” Ndyolashe said of how the school would handle the even less reliable supply anticipated. One thing he’s certain of is that sending children home isn’t an option. Ndyolashe appeals to the municipality to ensure ample time is given to schools, clinics and other public facilities so that proper measures can be taken in advance to maintain standards of safety and sanitation. * Updated Wednesday 16 January at 9.50am to include St Andrew’s College response. * Updated Wednesday 16 January at 2pm to include responses from St Mary’s and NV Cewu Primary Schools.